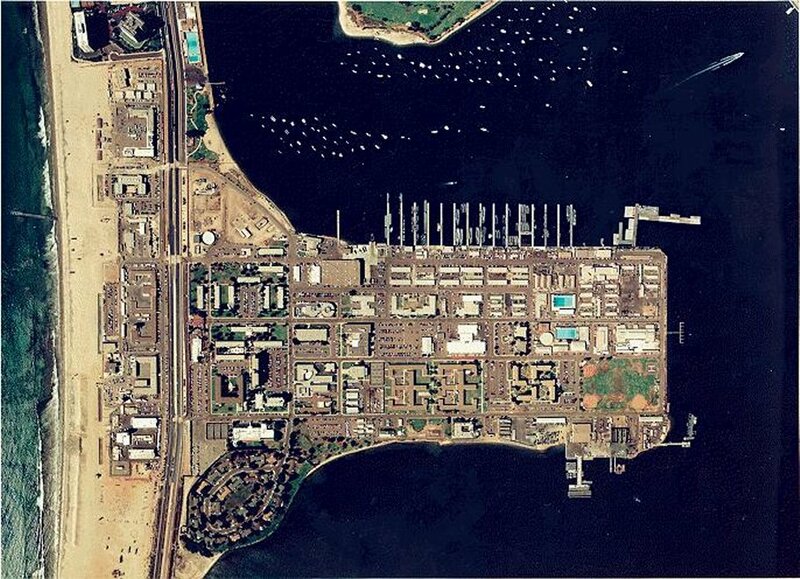 The Naval Amphibious Base (NAB) Coronado is located just across tha bay from San Diego, CA. The base is situated on the Silver Strand, between the San Diego Bay and the Pacific Ocean. NAB Coronado is a major shore command, supporting 27 tenant commands, and is the West Coast focal point for special and expeditionary warfare training and operations. The amphibious base houses Commander Naval Surface Force, US Pacific Fleet, responsible for the training, maintenance and crews of the approximately 90 ships of the Pacific Fleet and Commander Naval Special Warfare Command, US Pacific Fleet. Also located there are most of the Naval Expeditionary and Naval Special Warfare units of the Pacific Fleet as well as the famed Navy Parachute Team, the Leap Frogs. The Naval Amphibious Base was renamed in 1946, although it had been in operation as the Amphibious Training Base since 1943. It is host to thirty commands including the headquarters for the Naval Special Warfare Command, a second echelon command which is headquarters for America's elite maritime special operations forces - the U.S. Navy SEALs and Special Warfare Combatant Craft Crewmen. Naval Amphibious Base Coronado and its adjacent beaches provide training for Navy SEALs, amphibious insertion and other small units. The beach was recently designated a critical habitat pursuant to the Endangered Species Act for the Western Snowy Plover and the California Least Tern. To support the recovery of these species, the Navy now physically marks nesting areas and reschedule training to other areas during nesting season. The Navy also conducts an active predator control program on Coronado's beaches to protect nesting birds. Population counts are increasing for both species to the extent that in the year 2000 about 40-50% of the beach area normally available for training was lost to nesting. Formally commissioned in January 1944, Naval Amphibious Base (NAB), Coronado provides a shore base for the operations, training, and support of naval amphibious units on the West Coast. It is one of only two Navy amphibious training bases in the United States. NAB is approximately 1,000 acres in size and is composed of the Main Base, training beaches, California least tern preserve, recreational marina, enlisted family housing, and state park. State Highway 75 separates NAB into surfside (ocean) and bayside portions. The majority of the bayside is composed of fill materials dredged from San Diego Bay in the early 1940s. Amphibious training is conducted on both surfside and bayside beaches. To the south of the Main Base, the majority of amphibious training activities take place on about 257 acres of ocean beachfront property, leased from the State of California. A least tern nesting preserve is located on North and South Delta Beach between the NAB Marina and Main Base. NAB is located within the city of Coronado, California, a community of approximately 30,000. The city of Coronado covers nearly 9 square miles of land, and NAB lies south of the main residential and commercial portions of the city. 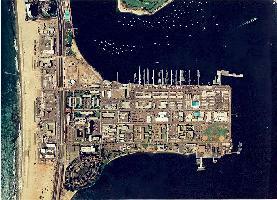 Another naval facility, Naval Air Station (NAS) North Island, is located northwest of the city of Coronado. South of NAB is the Silver Strand State Beach. In June of 1943, the Secretary of the Navy authorized the establishment of the Amphibious Training Base in the San Diego area to meet wartimes demands for trained landing craft crews. These crews were deployed to the South Pacific area of operations, where their successful and historical efforts were contributory to the conclusion of World War II. The streets of the base bear the names of those famous battles which led to the defeat of the Japanese Empire: Guadalcanal, Tarawa, Tulagi, and Bougainville, to name a few. In 1946, the base was renamed Naval Amphibious Base (NAB) Coronado and its primary mission was changed to that of providing major administrative and logistical support to the amphibious units which are located on the base. The base also conducts research and tests of newly developed amphibious equipment. The property itself was formed by land-fill, dredged from the bottom of the San Diego Bay. Even today the water table is but a few feet below the surface. The base has remained in an active, operational status since its initial establishment. In 1952, a military construction program was begun to replace some of the World War II "temporary" buildings and, in 1989, a comprehensive master plan outlined the future development of the base. Today, the Base is a major shore command supporting 27 tenant commands and units. The average on base count of all personnel, military and civilian, at any one time is 5000 permanent and 7000 students, reservists, and transients. Located on the Silver Strand between San Diego Bay and the Pacific Ocean, Naval Base Coronado is the West Coast hub for naval amphibious operations, including training and special warfare. At present, 27 tenant commands include mainly amphibious organizations but other important commands such as Commander, Naval Surface Force, U.S. Pacific Fleet; Naval Special Warfare Command; and Commander, Expeditionary Warfare indicative of the increased emphasis in this area of operations. Coronado has been attracting visitors for over a century. The only access to Coronado is by a two-mile bridge or an hourly ferry. That is because Coronado is connected to the mainland by only a narrow stretch of sand known as the "Silver Strand." When the famous Hotel del Coronado opened in 1888, people began coming to Coronado to stay in this luxurious hotel, and the tradition has continued ever since. Coronado is also occupied by the North Island Naval Air Station. There are many shops and restaurants to keep tourists amused while relaxing on this beautiful stretch of land.